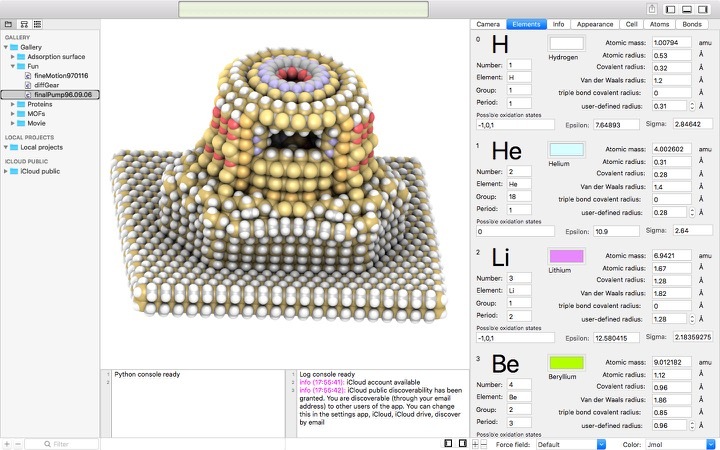 iRASPA is a visualization package (with editing capabilities) aimed at material science. Examples of materials are metals, metal-oxides, ceramics, biomaterials, zeolites, clays, and metal-organic frameworks. iRASPA is exclusively for macOS and as such can leverage the latest visualization technologies with stunning performance. iRASPA extensively utilizes GPU computing. For example, void-fractions and surface areas can be computed in a fraction of a second for small/medium structures and in a few seconds for very large unit cells. It can handle large structures (hundreds of thousands of atoms), including ambient occlusion, with high frame rates. Via iCloud, iRASPA has access to the CoRE Metal-Organic Frameworks database containing 4764 structures and 2932 structures enhance with atomic charges. All the structures can be screened (in real-time) using user-defined predicates. The cloud structures can be queried for surface areas, void fraction, and other pore structure properties. iRaspa is written in Swift. The use of augmented and virtual reality in chemistry is slowly starting to gain traction. The initial use of virtual reality in drug discovery is well documented but usually confined to highly specialised hardware which has limited it's exposure to a wider audience. However as described by Jonas Boström at the recent Chemistry on Mobile Devices Meeting Virtual reality smartphone apps making chemistry look and feel cool. This project aims to enhance the learning experience for school chemistry lessons by providing virtual reality viewing of molecules using inexpensive Google Cardboard viewers available online. Virtual reality smartphone apps are making chemistry look and feel cool. This project aims to enhance the learning experience for school chemistry lessons by providing virtual reality viewing of molecules using inexpensive Google Cardboard viewers. 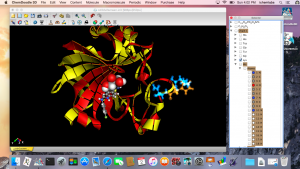 EduChemVR have a number of apps for download to allow users to interact with macromolecules or learn stereochemistry. The power of the latest generation of smart phones has enabled scientists to also explore augmented reality. Augmented reality is now being used in a number of situations. To enhance publications as demonstrated by Alistair Crow, if you want to know how to do this instructions are available here. Many people have probably used the superb ChemTube3D website created by Nick Greeves at the University of Liverpool which is an invaluable education resource, this is also accessible via a Smartphone app. More recently some of the pages have been enhanced to provide access to virtual reality models, if you would like to develop similar pages there is an AppleScript droplet to batch convert Jmol files into files suitable for AR. More recently Mark Costner has released MoleculAR: an augmented reality (AR) app to view molecules in 3D. The images of molecules for use with the MoleculAR augmented reality app are available on GitHub and there is a more detailed explanation here. The results of the Avogadro 2018 Community Survey are now in. 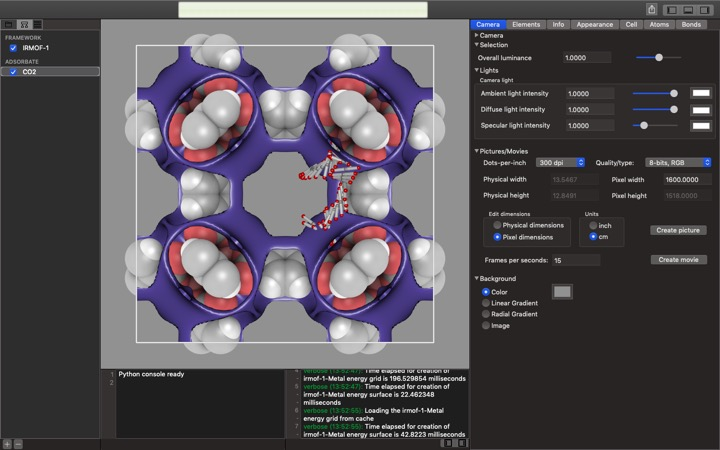 Avogadro is an advanced 3D molecule editor and visualizer designed for cross-platform use in computational chemistry, molecular modeling, bioinformatics, materials science, and related areas. It offers flexible high quality rendering and a powerful plugin architecture. The most common way people hear about Avogadro by word of mouth. You can read more here DOI. A recent publication DOI describes a new application for materials science. A new macOS software package, iRASPA, for visualisation and editing of materials is presented. iRASPA is a document-based app that manages multiple documents with each document containing a unique set of data that is stored in a file located either in the application sandbox or in iCloud drive. The latter allows collaboration on a shared document (on High Sierra). A document contains a gallery of projects that show off the main features, a CloudKit-based access to the CoRE MOF database (approximately 8000 structures), and local projects of the user. Each project contains a scene of one or more structures that can initially be read from CIF, PDB or XYZ-files, or made from scratch. Main features of iRASPA are: structure creation and editing, pictures and movies, ambient occlusion and high-dynamic range rendering, collage of structures, (transparent) adsorption surfaces, cell replicas and supercells, symmetry operations like space group and primitive cell detection, screening of structures using user-defined predicates, and GPU-computation of helium void fraction and surface areas in a matter of seconds. Leveraging the latest graphics technologies like Metal, iRASPA can render hundreds of thousands of atoms (including ambient occlusion) with stunning performance. iRASPA is available from Mac app store. The LiteMol suite consists of three components, data delivery services (CoordinateServer and DensityServer), the BinaryCIF compression format, and a new lightweight 3D molecular viewer (LiteMol Viewer) https://www.nature.com/articles/nmeth.4499.epdf?. You can try it out at https://www.litemol.org/. The LiteMol suite works on all modern web browsers and mobile devices. Standard visualizations: cartoons, surface, balls and sticks, etc. Electron Density and CryoEM maps. Integration with PDBe API: view and explore validation and annotation data. Integration with the Coordinate Server: download only parts of structures you are interested in. Support for the BinaryCIF format that reduces the amount of data that needs to be sent to the client several times. Allister Crow recently posted a brilliant twitter post of a movie showing a crystal structure in augmented reality: https://twitter.com/Allister_Crow/status/933000138552901632 and he posted a simple HowTo. I've taken the original instructions and expanded them to include a few extra options including how to add colours based on a comment by @tomkazimiers. Download is free for noncommercial use. Platforms: Windows, Mac OS X, Linux. 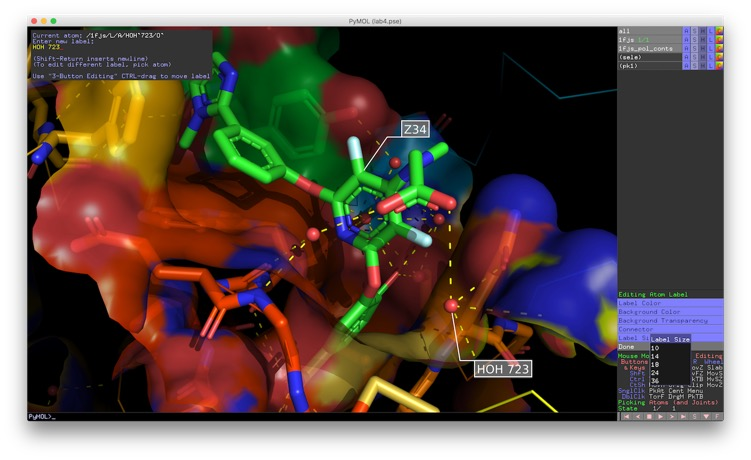 The popular molecular visualisation application Pymol has been updated to version 2.0. This is a major update and the changes are detailed below. The new user interface and all core improvements will be pushed to the open source SVN repository early next year. SeeSAR has been updated to version 7. There is a review of an older version of SeeSAR here. However SeeSAR is a constantly evolving and improving piece of software. Full integration of ReCore functionality. Now - besides fragment-replacement, joining and merging of fragments is also possible. In addition, you can fine-tune results delivered by ReCore using pharmacophore filters. Editing turns into full-blown designing. Besides atom by atom changes you may now add the most common rings with just one klick. So large changes can quickly be made to molecules and this in itself necessitates another new feature — namely that multiple poses are generated based on a superposition of the maximum common substructure. Display of torsion distribution. On the one hand, we have now integrated the latest update of the database of torsion angle distributions from the CSD, while on the other, it is now possible to view the torsion angle distribution for a particular rotatable bond. Miscellaneous enhancements. The SDF export covers your particular selection of favourites and any comments attached to a molecule. For a numerical filter it is now possible to define both a lower and upper bound. Last but not least, besides distances, you may now measure angles and torsions. ChemDoodle 3D is a scientific visualization platform with a focus on user customizability and universal support. Just like its 2D counterpart, all of the graphics are fully customizable and controllable. The large feature set is well organized for intuitive access and we develop ChemDoodle 3D to work with the vast majority of graphics cards in use. ChemDoodle3D really excels at the creation of high quality publication ready graphics, the ability to specifically select every atom or bond enables the user to precisely create the desired image. It performs well using modest hardware that would be accessible to any student. Perhaps one of the real attractions however is the ability to use the ChemDoodle Web Components to easily share structures via the web. The all new SeeSAR 6 provides you with a completely redesigned and now fully customizable GUI. You can choose between different bright and dark themes and GUI layouts so that you can optimally adapt SeeSAR for different use cases. The new design is more streamlined and customizable. Instead of having 8 different kinds of buttons in different regions of the application, we now have just a main menu top left and a toolbar top right. The main menu changes depending on the mode of use (editing, site definition, ...), while the toolbar stays the same throughout. This way you are never overwhelmed with choices, but are only presented with options that you may need. Depending on you current use case, you may also want to change the overall layout (many molecules ⇒ tables to the left; many properties ⇒ tables below to make use of the whole width; 2 monitors ⇒ tables docked out) and/or the overall appearance (bright theme for presentations; dark theme for desktop work; we have also integrated a color blindness mode just in case). In order to give you a jump start when you begin working with SeeSAR (both as a newcomer, as well as a seasoned user of the old GUI design), we have introduced an in-application help facility in this new version. First of all, upon starting the tool for the first time or after a long break in use, SeeSAR offers you a short introductory slide show, reminding you of a few basics that can make life a lot easier. But you can also now request help from within the application with a click on the lifesaver button. The help window then shows you – context dependent – explanations on the mode in which you are currently working or on the functions that you are trying to use so you can leave the help window open, consulting it when you need it. Of course you may also navigate between help pages in the help window and from there access online resources such as tutorial videos. has changed a lot and many new features – like multi-protein handling – have been added. So this webinar is of interest for both, seasoned users and newcomers to SeeSAR. It shall give you an update of the recent changes and guide you through the most important features based on medicinal chemistry use cases. Webinar attendees are entitled to a free 4-week trial license. It has been a little while but ChemDoodle 3D is out, and looking at the new features it was certainly worth the wait, this is a major upgrade! Full support for the new RCSB MacroZZmolecular Transmission Format. 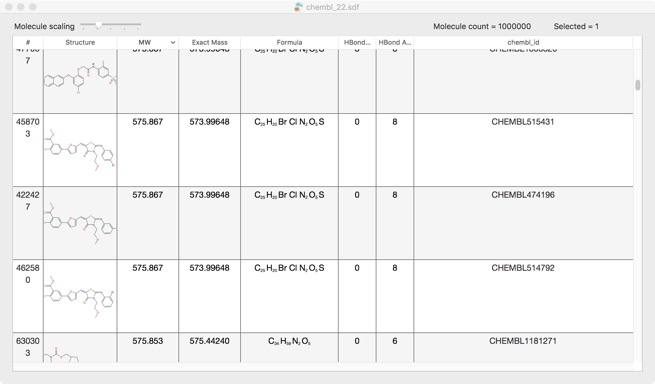 Chirys View is a simple molecular spreadsheet for Mac OSX. 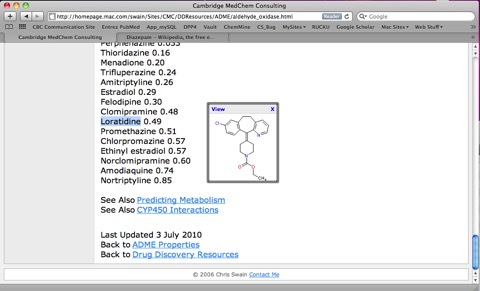 It has been designed as a fast viewer for collections of molecules represented as an SDF file (Structured Data Format). On import molecular weight, exact mass, molecular formula, hydrogen bond acceptor and donor counts are automatically calculated. You can combine multiple SDF files by multiple file imports or by coping and pasting from one document into another. You can then save selected compounds as new SDF file. I imported 1 million structures from ChEMBL and whilst it took a few minutes to load and used 27GB RAM it did so without complaints, scrolling down a list of a million compounds is a little impractical but list sorting is pretty responsive. I had a look at some of the more complex structures and they molecular layout seems excellent and clearly legible. As a simple molecular selection tool Chirys View works very well. My only complaint is that when you import 3D structures (e.g. from a docking run) the structures can be difficult to discern (see below), it would be nice to have a convert to 2D option. I've only just noticed that UnityMol has been updated. 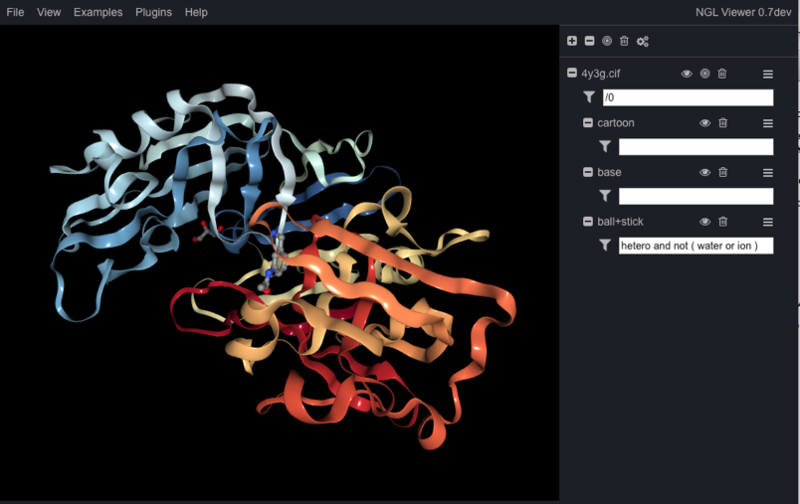 UnityMol is a molecular viewer and prototyping platform for the Unity3D game engine developed by Marc Baaden's team in Paris. It includes HyperBalls designed to visualize molecular structures using GPU graphics card capabilities based on shaders (GLSL or Cg). 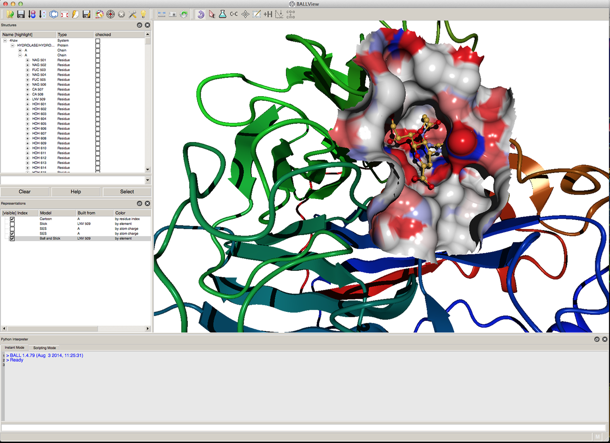 It can read Protein Data Bank (PDB) files, Cytoscape networks, OpenDX maps and Wavefront OBJ meshes. 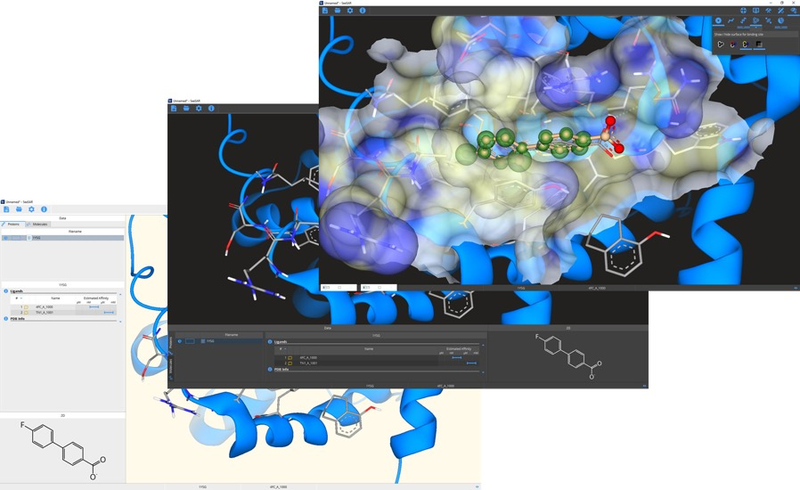 There is a UnityMol WebGl demo available http://www.baaden.ibpc.fr/umol/webgl/ which gives you a great way to explore the display options now available. A while back I mentioned a JMOL script for creating files for 3Dpriting the paper desiring the work has now been published in Journal of Cheminformatics DOI. Three-dimensional (3D) printed crystal structures are useful for chemistry teaching and research. Current manual methods of converting crystal structures into 3D printable files are time-consuming and tedious. To overcome this limitation, we developed a programmatic method that allows for facile conversion of thousands of crystal structures directly into 3D printable files. The Jmol 3D Print website allows the creation of STL and VRML files for 3D printing for any structure in the Open Crystallography Database. You can search either the full COD and then design your own model for printing, or search the more than 30,000 predefined sample files in the figshare collection and download the STL or WRL files that have already been created for those structures. A Jmol Script for Programmatic Conversion of Crystal Structures into 3D Printable Files can be downloaded here created by Vincent F. Scalfani, Antony Williams and Valery Tkachenko. 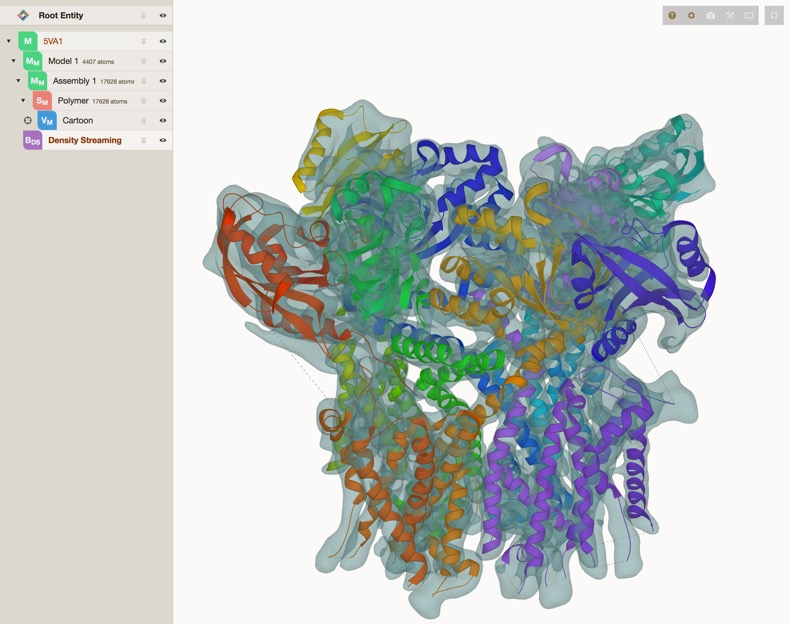 Molmil has been designed as a light-weight and full-featured viewer for the PDB. As such, Molmil can load legacy PDB flat files, PDBx/mmCIF and PDBML formatted files. Molmil can also load a custom format which we call PDBx/mmJSON, which is a JSON version of the PDBx/mmCIF data. Other formats which Molmil supports are GRO, MOL2, MDL, CCP4 (for electron density maps and EM data), MyPresto’s trajectory format, Gromacs’ TRR and XTC trajectory formats and our own developed MPBF polygon format which we are using for our eF-site service for large structures. Users can also load these files from their local hard drive. The source code is available at http://github.com/gjbekker/molmil under the LGPLv3 licence. First integration of @UnityMol in the @HoloLens ! An update to UCSF Chimera (version 1.11) is available for download. 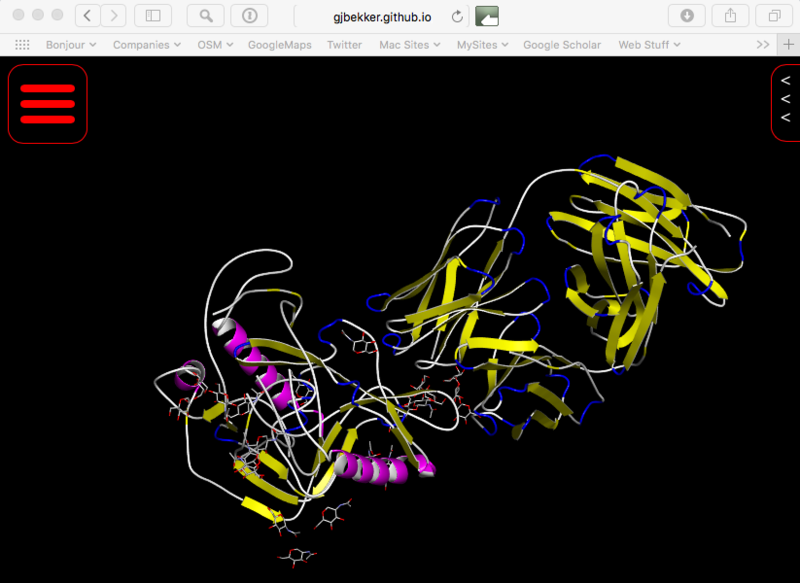 Chimera is developed by the Resource for Biocomputing, Visualization, and Informatics at the University of California, San Francisco (supported by NIGMS P41-GM103311). I'm making increasing use of iPython notebooks and this package looks like it will be very useful. The notebook widget allows you to rotate and zoom the molecule and lets you select atoms by clicking on the molecule. There have been a number of comments and responses via twitter highlighting this superb demo. The project is on Github, feel free to contribute! The latest version of iBabel has now been downloaded over 400 times since it was released in January. BALL (Biochemical ALgorithms Library) is an application framework implemented in C++ that has been specifically designed to reduce development times in the field of Computational Molecular Biology and Molecular Modeling. It provides an extensive set of data structures as well as classes for Molecular Mechanics, advanced solvation methods, comparison and analysis of protein structures, file import/export, and visualization. 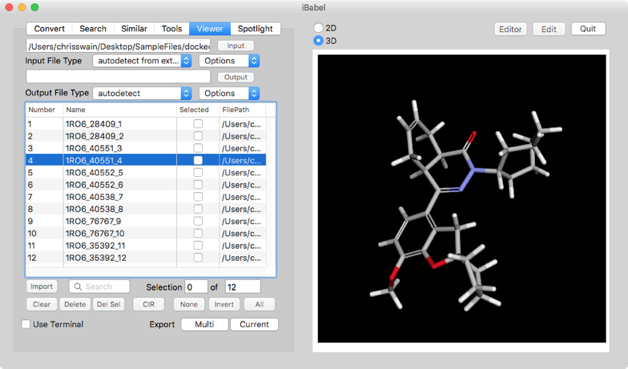 BALLView is BALL’s standalone molecular modelling and visualization application. 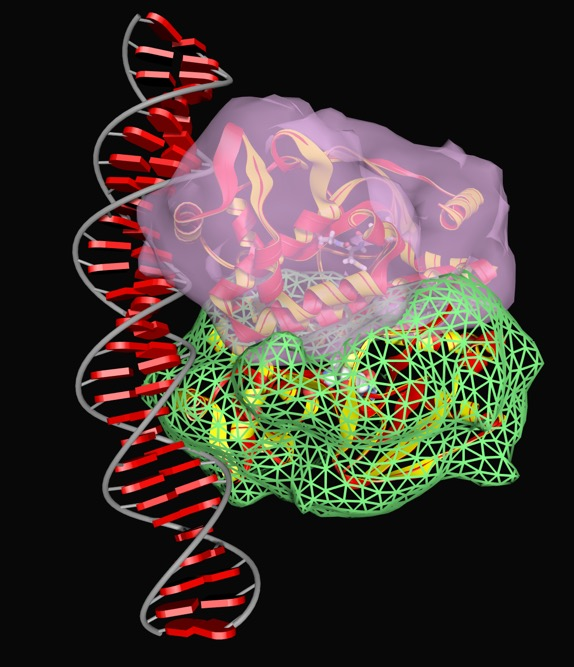 Furthermore, it is also a framework for developing molecular visualization functionality. I've just added Unicon and Mona to the alphabetical listing of applications. UNICON is a command-line tool to cope with common cheminformatics tasks. 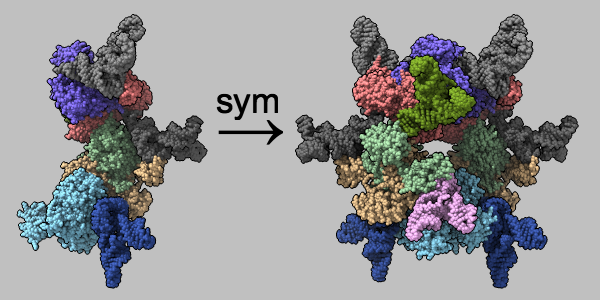 The functionality of UNICON ranges from file conversion between standard formats SDF, MOL2, SMILES, and PDB via the generation of 2D structure coordinates and 3D structures to the enumeration of tautomeric forms, protonation states and conformer ensemble. Mona is an interactive tool that can be used to prepare and visualize large small-molecule datasets. A set centric workflow allows to intuitively handle hundred thousands of molecules. ChemDoodle 3D has been updated and in addition for a limited period any customer that upgrades to or purchases ChemDoodle 8 will receive a free license for ChemDoodle 3D v2. A nice comparison of the options for displaying crystal structures within a browser without the need for plugins/applets. Here we compare four open-source browser engines for plugin-free rendering of the crystalline structures in CIF format. 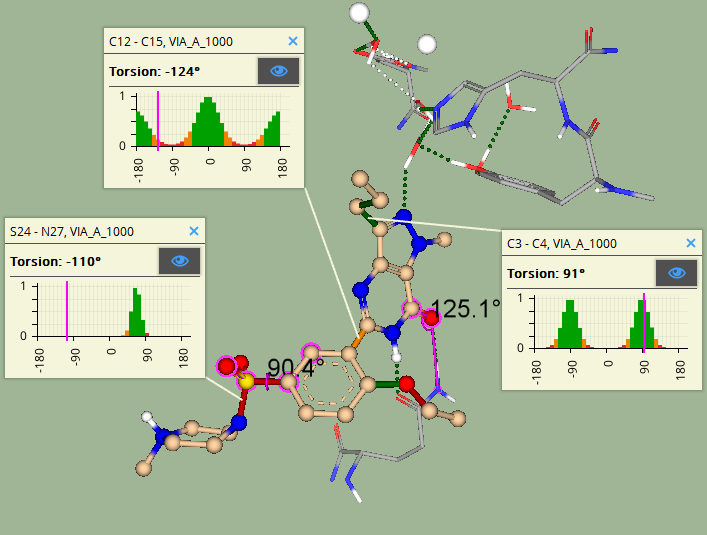 Lucas is a novel program for graphical display and editing of molecular systems. The program allows fast and easy building and/or editing different molecular structures, up to several thousands of atoms large. Luscus is able to visualise dipole moments, normal modes, molecular orbitals, electron densities and electrostatic potentials. In addition, simple geometrical objects can be rendered in order to reveal a geometrical feature or a physical quantity. 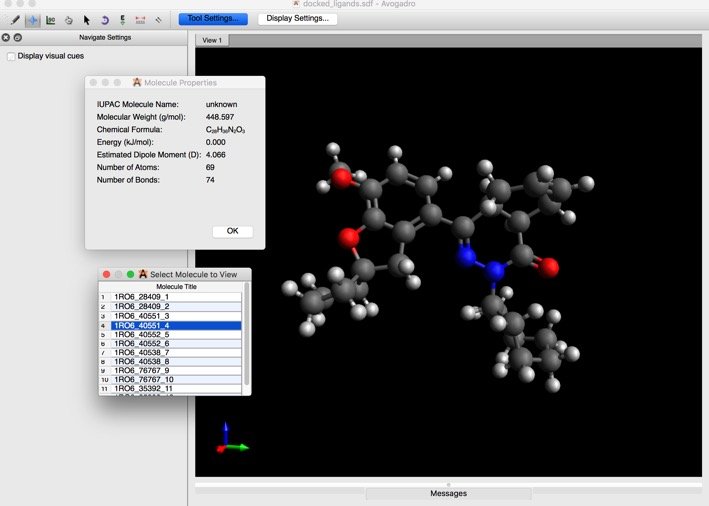 The program is developed as a graphical interface for the MOLCAS program package, however its adaptive nature makes possible to use luscus with other computational program packages and chemical formats. All data files are opened via simple plug-ins which makes easy to implement a new file format in luscus. 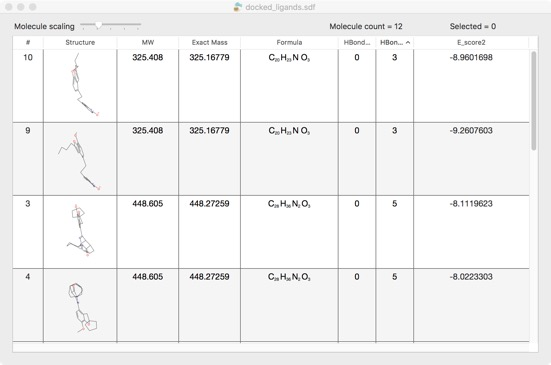 The easiness of editing molecular geometries makes luscus suitable for teaching students chemical concepts and molecular modelling. 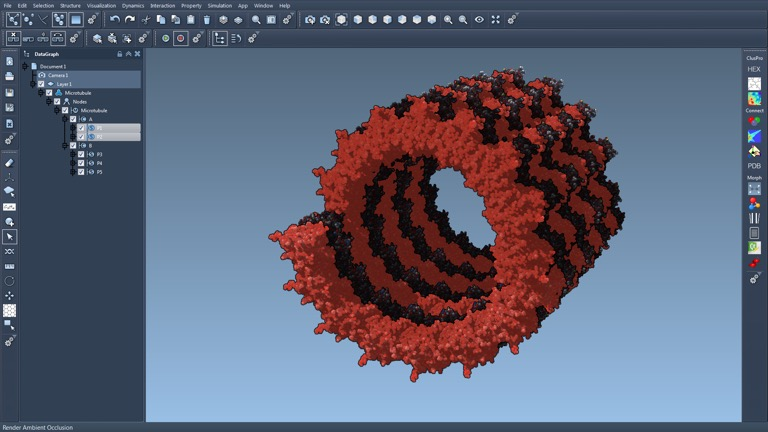 BioBlender, the molecular visualization and animation tool based on Blender, is now an Open Program on GitHub. You can find it here: https://github.com/MonZop/BioBlender. BioBlender is an addon for Blender, aimed at providing tools for the import and elaboration of biological molecules. It consists of several functions, some executed by Blender and/or its Game Engine, and some others performed by external programs, such as PyMOL, APBS etc. It was developed by the Scientific Visualization Unit of the Institute of Cliniclal Physiology of the CNR of Italy in Pisa, with the contribution of several colleagues.